On Day 6 of Online Card Classes' "Sparkle & Shine" class, Heather Ruwe had a lesson on "Faux Ombre Embossing with Distress Inks." I used that technique with this card. To create the background, I used Mustard Seed, Fossilized Amber, & Rusty Hinge Distress inks and Winnie & Walter's "Madison" Creative Screenings stencil. 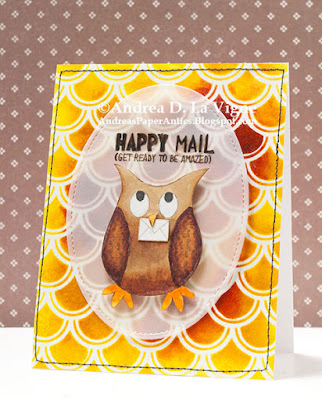 I wanted to go for a more gender-neutral card, and knew I would use the "Curious Owl" stamp by Hero Arts. I thought the stencil resembled feathers, hence my choice. After finishing the background, following Heather's instructions, I stamped the owl onto a scrap of Strathmore Smooth Bristol paper with Hero Arts Wet Cement ink. I colored that with my Zig Clean Color Real Brush markers, using a water brush (sparingly) to blend the color a little in places. Then I set that aside to dry, before fussy cutting him out. I stamped an envelope from Technique Tuesday's "Random Act of Cardness" set onto bristol paper with Wet Cement, and fussy cut it out. I used a craft knife to cut along the sides of the owl's beak, and slipped the envelope into the slits, gluing it in place with a bit of liquid glue. To complete the card, I adhered the owl to the oval with foam tape, and used Scor-Tape pieces on the back of the vellum (behind the owl) to adhere it directly to my background. I felt the panel needed a little more definition, so I machine-stitched around the perimeter with black thread. I finished by adhering the card front to a white A2 card base. I will leave this card in our mailbox for our postal carrier, just as a little appreciation card, as part of Jennifer McGuire's #ShareHandmadeKindness campaign. A Blog Named Hero: "Watercoloring"
Pile It On #130: "Animal"
This is so cute ! I just love the owl and lovely background also. Wonderful card - love the background!